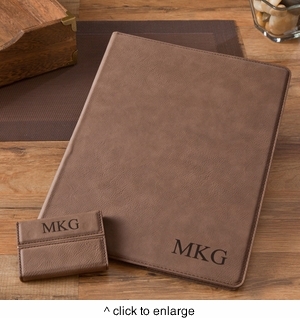 DETAILS: Our Mocha, personalized portfolio & personalized business card case set is a terrific gifts for any professional. Durable construction and with a soft feel. Both items are personalized identically. Portfolio includes an 8 ½” x 11” note pad. Card case feathers a chrome steel compartment with a magnetic closure. Made of simulated suede leather. MEASUREMENTS: Portfolio 12" x 9 3/8" x 1/2"
Business Case 3 3/4" x 2 1/2" x 1/2"
PERSONALIZATION: 3 initials. Personalization has to be the same for both items.